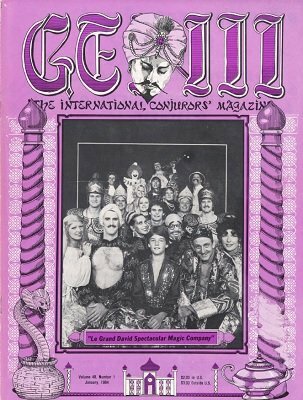 The Original Current Program of Marco the Magi's Production of "Le Grand David and His Own Spectacular Magic Company"
A Few Words About "Uncle Joe"
The Ultimate Floating Deck - Ben Harris - reviewed by Gerald R. Blount, Jr. The World's Greatest Magician - Robert E. Olsen - reviewed by Gerald R. Blount, Jr.
Side Three. Three? Why Not?